Criacr Wired Kids Headset is the best gift for children in different ages. The premium speakers provide high quality sound. Soft protein earmuffs get close to ears to reduce noise and bring all-day comfort. No matter what age your children are, the adjustable headband is suited for them all the time. Its foldable design saves the space greatly. The cable is strong and tangle-free, which avoids pulling the cable apart or getting it knotted by kids. Furthermore, it enables you to realize voice interaction and call via a built-in Mic. 1. Please do not use the headphone for a long time to prevent hearing impairment. 2. Please do not wear the headphone to listen to music while riding, driving and walking in case of traffic accidents. 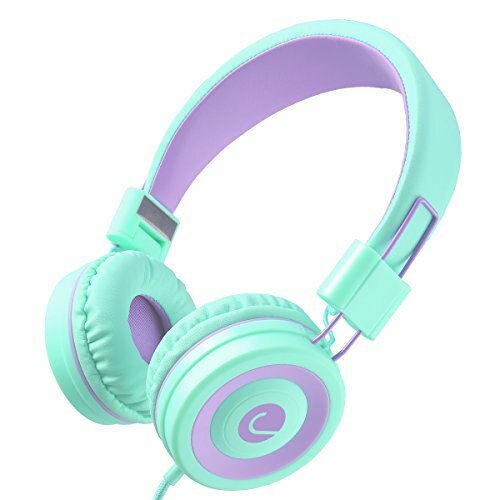 DESIGN FOR KIDS & TEENAGERS - The headphone designed with elastic sponge cushion and protein earmuffs bring children excellent wearing feeling.It does not create stress and any discomfort despite long wearing. In addition, the compact earmuff effectively reduces noise and provides a clear sound quality. FOLDABLE & ADJUSTABLE HEADPHONES - The foldable and lightweight design makes the headset convenient to carry and store. The stretchable headband can be adjusted freely as you prefer, fitting in various headforms of children in different age groups. CHILD-FRIENDLY CARE - This over ear headsets bright and colorful body appeals to kids' interest. The whole headset is made of non-toxic and harmless material, safe and environmental. Tangle-free cord shows good tensile resistant performance as well. Flexible and durable headband is available to be bent without deformation, ensures durability and keeps the headset away from being destroyed easily by children. HD MICROPHONE & HANDS-FREE CALL - You can manage music playing and calling by pressing the button on the in-line controller. The built-in microphone supports call, online voice communication and interactive learning. UNIVERSAL COMPATIBILITY - The kids headset is widely compatible with PC, iPhone, iPad, Android smartphone, tablet, MP3/MP4 and any digital devices with 3.5mm audio jack.